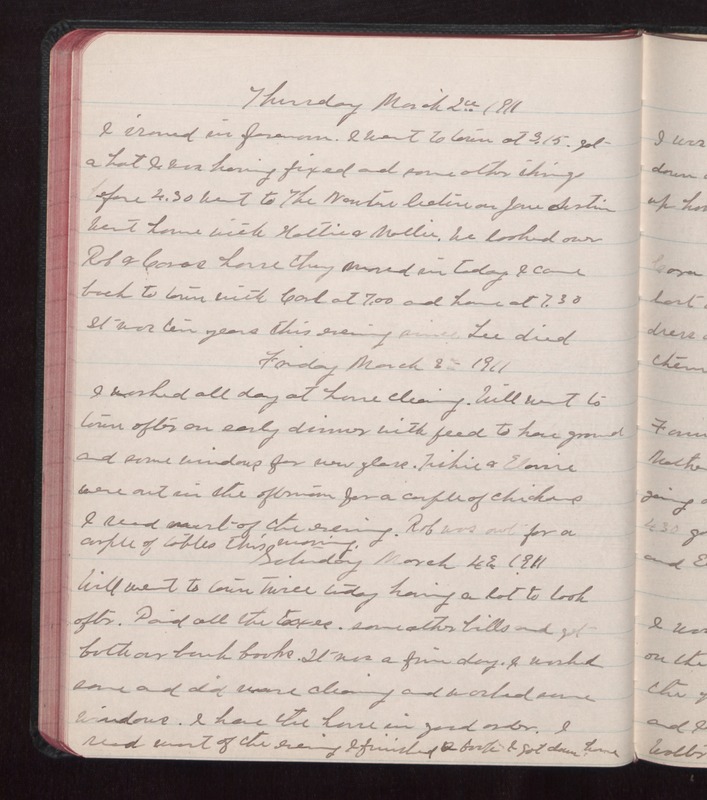 Thursday March 2 1911 I ironed in forenoon. I went to town at 3.15. Got a hat I was having fixed and some other things before 4.30 Went to The Newton lecture on Jane Austin Went home with Hattie & Mollie. We looked over Rob & Coras house They moved in today I came back to town with Carl at 7.00 and home at 7.30 It was ten years this evening since Lee died Friday March 2 1911 I worked all day at house cleaning. Will went to town after an early dinner with feed to have ground and some windows for new glaze. Trishie & Elouise were out in the afternoon for a couple of chickens I read most of the evening. Rob was out for a couple of tables this morning. Saturday March 4 1911 Will went to town twice today having a lot to look after. Paid all the taxes, some other bills and got both our bank books. It was a fine day. I worked some and did more cleaning and washed some windows. I have the house in good order. I read most of the evening I finished a book I got down home.